She's Caroline all over - what a beauty, easily THE most beautiful "royal". I know, she's not royal but she's lumped with them. Technically she IS royal. She just doesn't have a title. But royal blood flows through her veins. Charlene is royal BY marriage but NO royal blood flows through her veins. Big difference and yes she is quite striking. yes big difference, see Queen Mathilde, you see that she is born royal. Both women are beautiful, but Caroline is so kind and charismatic. Charlotte is not, she always has a suspicious and tensed look in her eyes. Grimaldi's founder (a.k.a. "Malizia", the italian word for malicious man) was a pirate, who stole Montecarlo fortress from monks that lived there. Ranieri's mother was an Algerian born woman who was legitimated by Prince Louis in order to continue the dinasty. I am not a fan of Princess Charlene, but I think her blood is not inferior to Charlotte's! Charlotte's ancestors are like Charlene's : common people. None of them has what you call "royal blood". (In reality, just a couple of european modern royals are 100%royal. For exemple, Prince George, Victoria of Sweden, Leonor of Spain and Hakon of Norway have 4/8 of nobility and Estelle of Sweden just 2/8... ). The concept "royal-family" is always the concept of "mantaining power". This blog fits perfectly into the concept. The "royal-family-concept" is a charming construction of mankind. It is comparable with religious beliefs or beliefing in sport-events like Olympia. Lady Diana said: ....I just want to feel save and secure." That was, what she was looking for. She never wanted to harm anybody. That is making the point of blood I think doing good. She is beautiful, no question. Beauty is a gift of nature and she has it and a lot more. Gad did not stand by her side when she was pregnant and gave birth to their baby. There are many people who know that she is a decent woman. She's an attractive young woman but that's a bizarre photo for an ad. Yes, it is bizarre. What is it supposed to convey? I am sure the ad is profiling the bracelet and or earrings. Mont blanc is more than watches and leather goods. Toujours avec cette moue boudeuse! 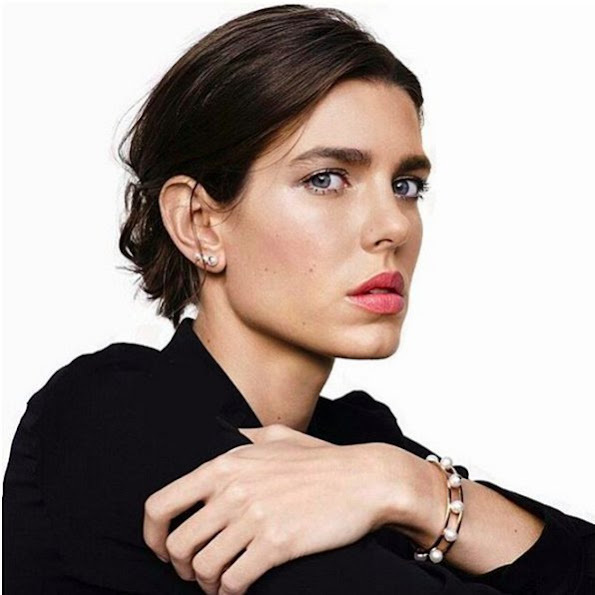 Je trouve Charlotte Casiraghi très jolie mais là, cette photo pour une pub, je ne comprends pas. Ce que je vois, c'est une jeune femme avec un air triste, voire même désabusé, qui semble plus subir cette séance que y prendre part avec plaisir. Montblanc veut vraiment s'associer avec ce que dégage cette personne dans cette image précise? Je me répète, mais je ne comprends pas. C'est quoi au juste la clientèle visée? J'ai moi-même un stylo Montblanc, mais si ce n'était pas le cas, je vous avoue que je ne serais pas du tout interpellée par cette publicité. Complétement d'accord avec vous !!! j'ai horreur de ces airs blasés alors qu'elle sont quand même privilégiées !!! Unfortunately none of the granddaughters of Grace Kelly has her beauty and elegance! Grace was rather unique, but her granddaughters are products of their time, I think. Charlotte is beautiful but she does not look happy. Pauline Ducruet is good looking, and Camille (Stephanie's other daughter) and Alexandra (Caroline's) are very ordinary looking, and absolutely lack elegance.I have never seen such an ugly or ill-fitting dress as Camille was wearing for Albert's wedding. Pauline's and Stephanie's dresses were not much better. Far from elegant, they made a very odd-looking trio at that wedding. Alexandra's dress looked like it came from a 1960's thrift shop! She is young and has a small body size, actually she dresses like a normal Teenager, she trys and not to bad, quite lovely. pourquoi c'est air boudeur ou soupconneux ???? Look at Charlotte's eyes - its like she's staring at the photographer and she's annoyed at being photographed. "Go away and stop bothering me with that camera!". Cela fait chic d'avoir l'air boudeur !!! Bof bof !! None of the daughters or grand-daughters of Grace Kelly have her elegance. Charlotte Casiraghi is attractive, but she has always appeared to be spoiled and a little sulky to me. I think Princess Stephanie's youngest daughter Camille might be the real beauty in the family, she may blossom, she may not, it will be interesting to watch and see. I do not believe that she recognized that she has done that. She seems to be a human being who is very symbiotic with her family. To me she is dependent in a way which not allowes her to get mature. She was the mojo of her brothers, who were her knights and she is/was Alberts favourite kid. She never had a real distance to Monaco. She do not knows that their is happy life out their and chooses the comfort. Gad is too much in love with her, therefore he feels humilated. As long she is hiding behind Monaco - she is successful because of the daugther-of-thing. She is beautiful and and and ...but to be mature needs talking, talking, talking. She is free of course, but it is not a sign of fine taste to appear IMMEDIATELY with an another lover. I don't like Gad, but is lack of respect towards her son and the father of her son.